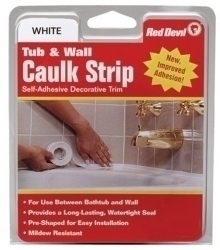 Self-adhesive decorative trim is pre-shaped for fast, easy installation between the bathtub and wall. It provides a long-lasting seal and gives a finished professional look to kitchen and bath areas. Best of all, the caulk strip installs in minutes - simply peel and press into place. No tools or messy clean up! Cured strip is mildew resistant. Product Details: 1 5/8 in. x 11 ft. Perfect for cutting and trimming projects in the workplace and at home. Positive-lock, pull-back button retains blade tightly in cutting position and allows blade to retract safely into handle when not in use. Self-adhesive decorative trim is pre-shaped for fast, easy installation between walls and countertops. It provides a long-lasting seal and gives a finished professional look to kitchen and bath areas.